Phantom Lady, at least from a commercial standpoint, justified more spending on Universal's part than Robert Siodmak's just preceded Son Of Dracula. The latter was a case of a director outclassing material he'd been given, but even at that, Son Of Dracula was accorded a higher budget ($207,750) and longer shooting time (24 days) than horrors usually got. Off-the-rack and representative of typical U chillers Captive Wild Woman finished for far less (negative cost $89,725) and on much reduced schedule (11 days). It's as though Son Of Dracula was audition for better things to immediately follow provided Siodmak came through, which he clearly did, having wrapped the film under budget for $193,152, saving Universal over $14,500. 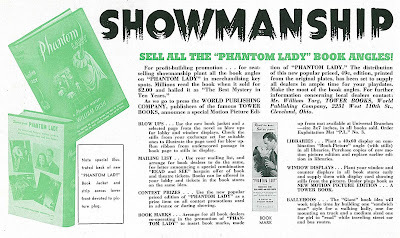 Promotion to Phantom Lady put Siodmak close as most Universal directors could get to an A. The mystery thriller was earmarked for $350,400 and 30 days shooting, from September 20 to October 28, 1943. Its cast held promise, if not immediate marquee strength. Top-billed Franchot Tone had done leads at Metro and was not as yet associated with humbler fare (that came later). 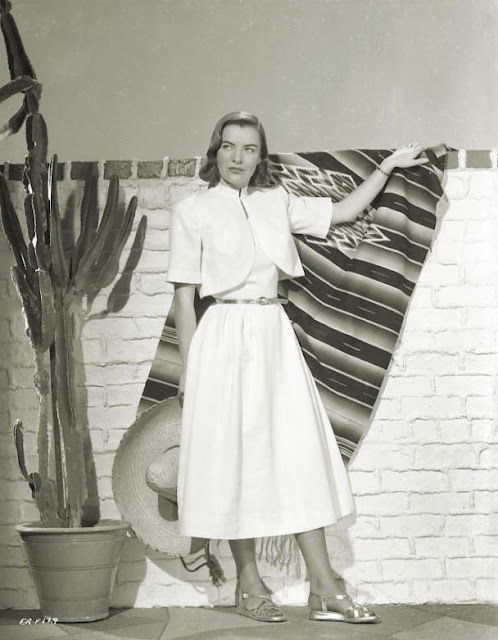 Ella Raines had been groomed by Howard Hawks, was featured in a property he'd developed for Universal called Corvette K-225, but something had distracted his interest (Lauren Bacall? ), so he ultimately sold her contract to the company. 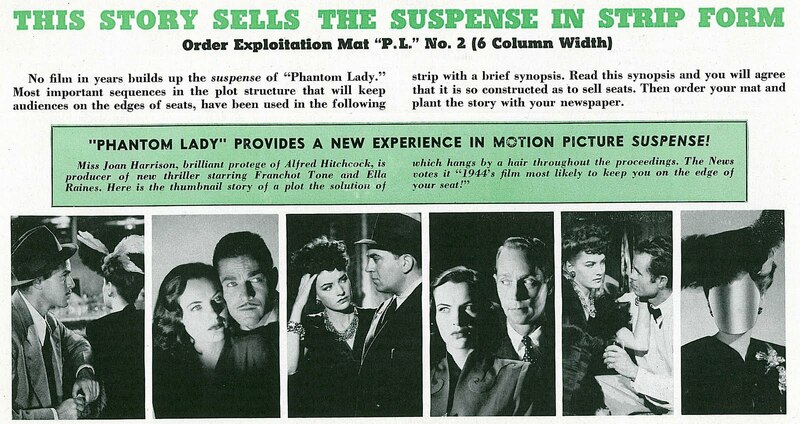 Phantom Lady was designed for appeal to first-run audiences, being suspense of a romantic rather than horrific nature. Robert Siodmak's creative touches figured to lend distinction and fire word-of-mouth for a yarn off well beaten paths. Alfred Hitchcock's fame had by that time inspired others to seek his level. Those with links to the recently anointed Master Of Suspense might sprinkle fairy dust on projects they pursued elsewhere, among them Joan Harrison, valued assist to AH on successes Universal hoped to duplicate. 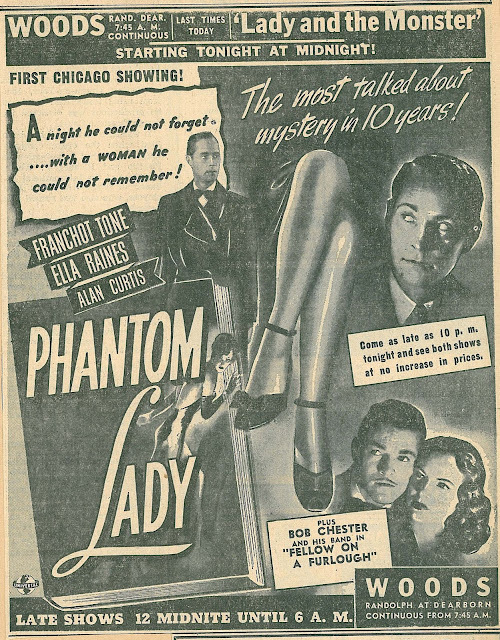 She'd produce, Siodmak would direct, and William Irish's novel would be adapted for Phantom Lady. Irish was actually prolific Cornell Woolrich, a to-be most familiar name credited on what we now call Film Noir. Siodmak began earning repute as a stickler for realism with Phantom Lady. He'd say audiences know all the plots, so character would be his emphasis. There was also this thing he had for stairways and certain items of furnishing (Siodmak also likes to shoot scenes with mirrors and beds in them, said a Times profile). Well, even dumb publicity was better than none at all, and Siodmak benefited from columnists willing to put him at least within reach of Hitchcock's grade. Fritz Lang was looking to crack that circle as well, and around the same time (with The Woman In The Window and Scarlet Street). 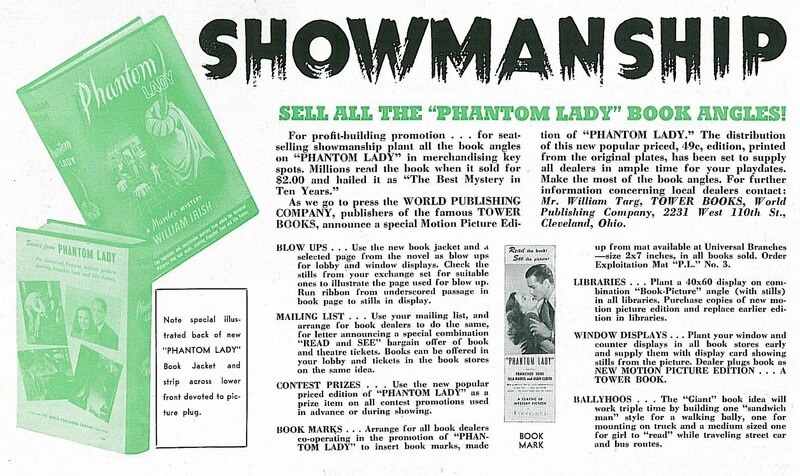 Both he and Siodmak were getting out thrillers very much of the AH sort, but critics like Bosley Crowther weren't having any, at least where Phantom Lady was concerned. Vaguely impressed with Germanic touches RS applied, Crowther nevertheless withheld approval: We wish we could recommend it, but ... they forgot to provide their picture with a plausible, realistic plot. 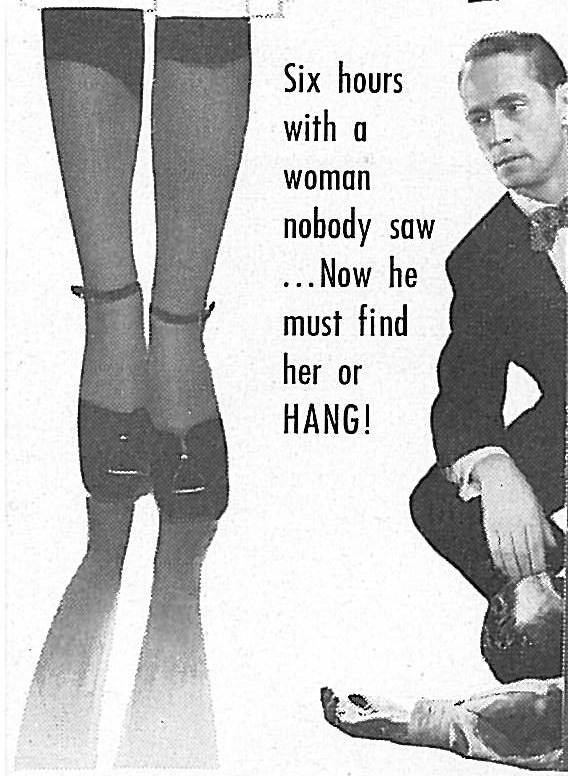 Reviewers were so much more about story over style in 1944 (February when Phantom Lady was released) and raked many a noir over coals for failure to cohere. We appreciate now that logic is what matters least in Phantom Lady. 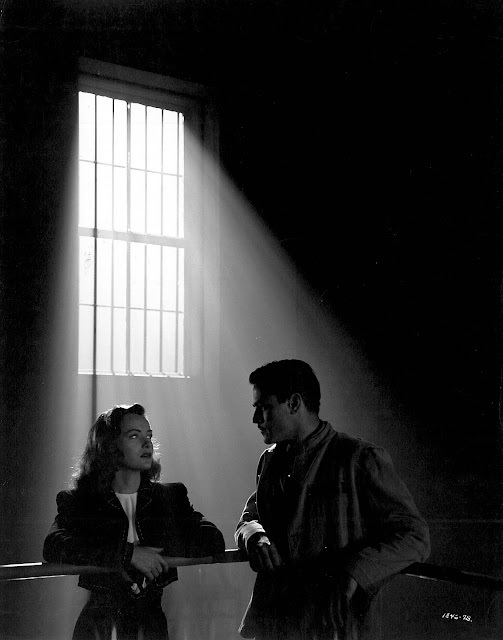 Siodmak drenched his 87 minutes in shadow and effect to compensate for narrative lapses. At least one dynamic sequence (about midway through ... wonder if Siodmak shot it first) has been lately described by dazzled newcomers as orgiastic, being a souped-up jazz riff wherein Ella Raines arouses Elisha Cook and his drum set. 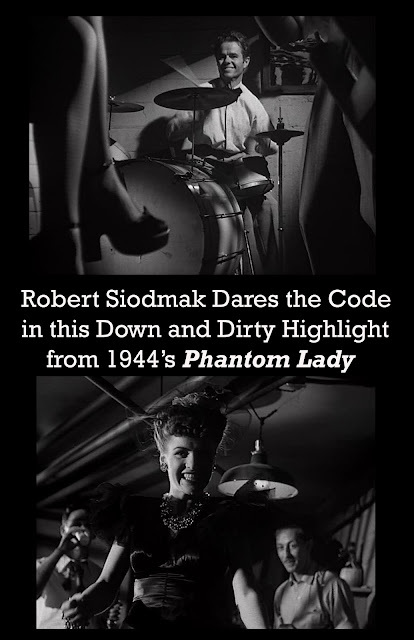 It is a remarkable moment, and I can imagine Siodmak looking to that Code-challenger as attention-getter and checkmate to censorial watchdogs. Phantom Lady turned on psycho killing in a contemporary setting, a device fresher then, its highlights Siodmak emphasized making up for drags and nonsense elsewhere. This one wouldn't rank among noir classics, but there were moments we'd not forget. The tier below The Maltese Falcon and Double Indemnity is, after all, made up of pictures like Phantom Lady. Completists look to these now for having seen acknowledged betters over and again, savoring unexpected pleasures such modest noirs provide. I'd not elevate Phantom Lady past minor status it's always had, but there are images clearer in my mind's eye than other more celebrated ones call up. Siodmak was realist enough to know how difficult it was to achieve just part of what he was after: Even in a film you make as you want to and because you want to, you're lucky if there are five minutes which satisfy you, in which you see just what you intended on the screen (this from Russell Taylor's 1959 interview). We might best classify Siodmak then, as a director who accumulated a lot of those five minutes over a Hollywood career that saw its brief summit during the 40's and mostly at Universal. There would be The Suspect, The Killers, and Criss Cross, among others. By 1951, he'd regret having been impaled upon the spike of melodrama, as a columnist that year put it, though being typed was preferable to representing no type. 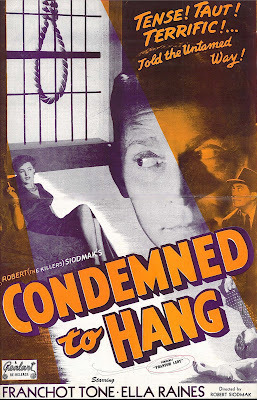 Siodmak's hit that was The Killers inspired leasing Realart Pictures to reissue Phantom Lady with a new title (Condemned To Hang), placement of The Killers between the director's first and last name, and rifling of a tag line (Told The Untamed Way!) that had been used to sell the 1946 film. 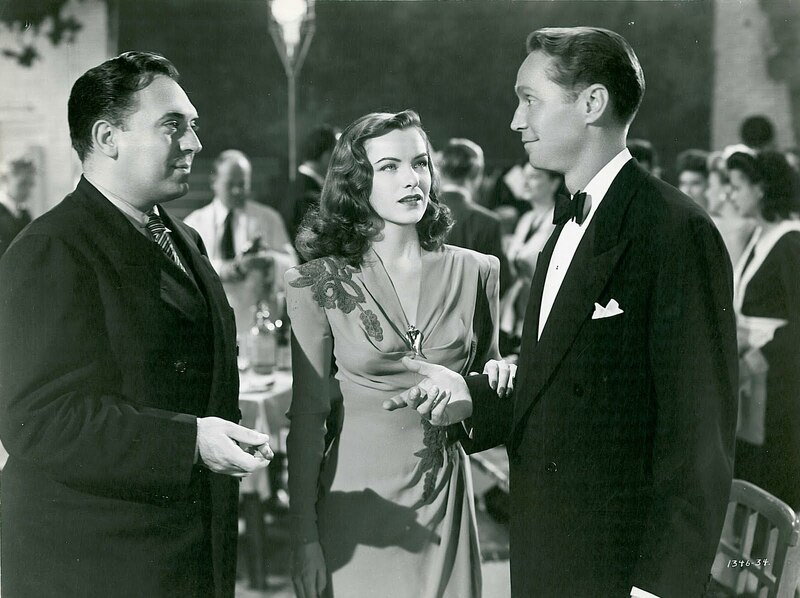 It would be The Killers for which Siodmak was best remembered, but Phantom Lady is a more than worthy runner-up and deserves a DVD release in this country. 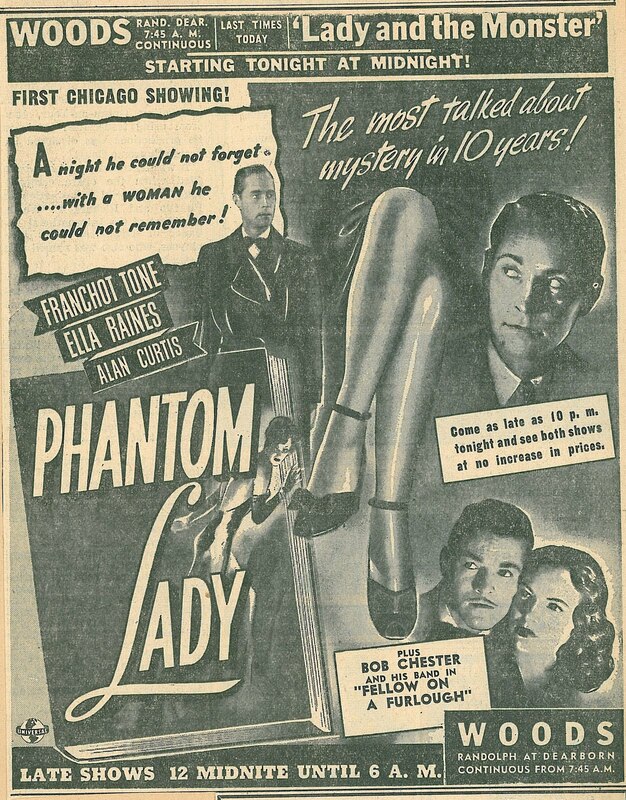 Thanks for the post on Phantom Lady, absolutely agree with you it is a minor film but a very good one. 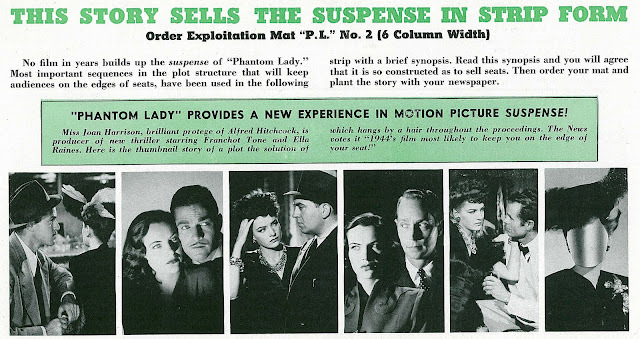 Wonderful post on Phantom Lady. It was my first exposure to Ella Raines. It is not top-of-the-line noir, but is a welcome addition to the noir category.